Two pioneering research projects will bring together 17 McMaster researchers, a dozen industry partners and more than 80 students thanks to $3.3M in research funding from the Natural Sciences and Engineering Research Council’s CREATE program. The CREATE (Collaborative Research and Training Experience) program trains the next generation of researchers to tackle Canada’s most pressing scientific challenges. “Japan is still struggling with the cascading economic and environmental impacts five years after a powerful earthquake and tsunami caused the meltdown of the nuclear reactors at Fukushima,” says El-Dakhakhni, professor in the department of civil engineering and founding director of the McMaster Institute for Multi-hazard Systemic Risk Studies. “Canada relies on nuclear power as a major component of its overall energy supply mix, but there’s a critical expertise gap that needs to be addressed to guarantee our nuclear infrastructure systems are resilient – that is, remain fully operational, or recover rapidly and safely, following a natural disaster,” El-Dakhakhni explains. The Canadian Nuclear Energy Infrastructure Resilience under Seismic Systemic Risk (CaNRisk) program, directed by El-Dakhakhni, combines the collective research talents of some of the world’s leading experts in nuclear safety (John Luxat and Shinya Nagasaki from engineering physics) with the civil engineering expertise of Pei Jun Guo (soil-structure interaction), DimitriosKonstantinidis and Mike Tait (structural and seismic control), Tracy Becker and LydellWiebe (earthquake engineering) and Sarah Dickson (water systems safety). CaNRisk was awarded $1.65M over five years, and will provide 44 students the opportunity to participate in hands-on internships with some of Canada’s key nuclear stakeholders, including Amec Foster Wheeler Nuclear Canada, Bruce Power, the Canadian Nuclear Safety Commission, Hatch Ltd., Kinectrics Inc., and Ontario Power Generation. CaNRisk also includes partners from Western University with expertise in uncertainty analysis and electrical engineering. 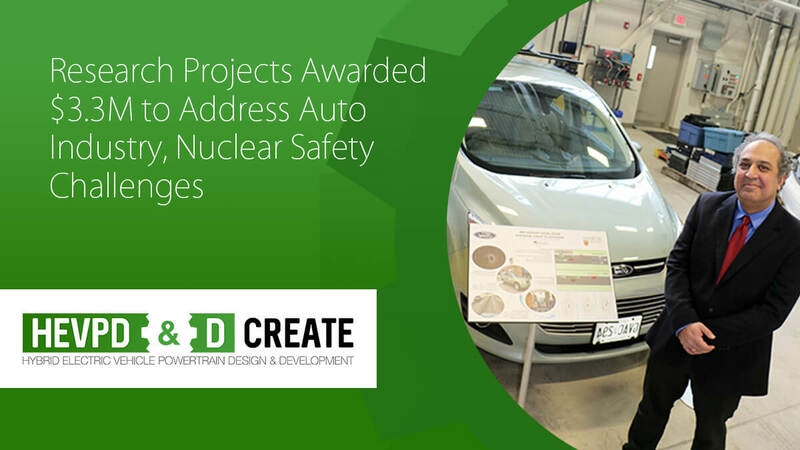 A second project, the CREATE Program in Hybrid Electric Vehicle Powertrain Design and Development, involves researchers from McMaster and the University of Windsor, along with industry partners Ford Canada, D&V Electronics, AVL Test Systems and Cadex Electronics. Led by Saeid Habibi, professor of mechanical engineering and NSERC/Ford Chair in Hybrid Technologies, the team will develop the talent for Canada’s automotive industry to address the challenges associated with new electric energy storage and electric propulsion technologies. Saeid Habibi with car. Students will benefit from working with researchers from a number of departments: Mo Elbestawi, Jim Cotton, Fengjun Yan, and Samir Ziada (mechanical engineering); Ali Emadi, and Nigel Schofield (electrical and computer engineering); and Gillian Goward (chemistry & chemical biology). “We are delighted that McMaster was awarded funding for two CREATE projects”, says Allison Sekuler, interim vice-president, research, noting that only 13 projects were awarded across the country.